The Kids in Health Careers program is designed to introduce students in Middle and High School to health careers. The program consists of a multimedia presentation that expresses the needs for health professionals in Indiana and the rest of the country. It also goes over some of the benefits gained from working in a health career as well as descriptions of a few selected example careers. At the end of the presentations students have the opportunity to ask questions they may have regarding this field and to obtain even more information. 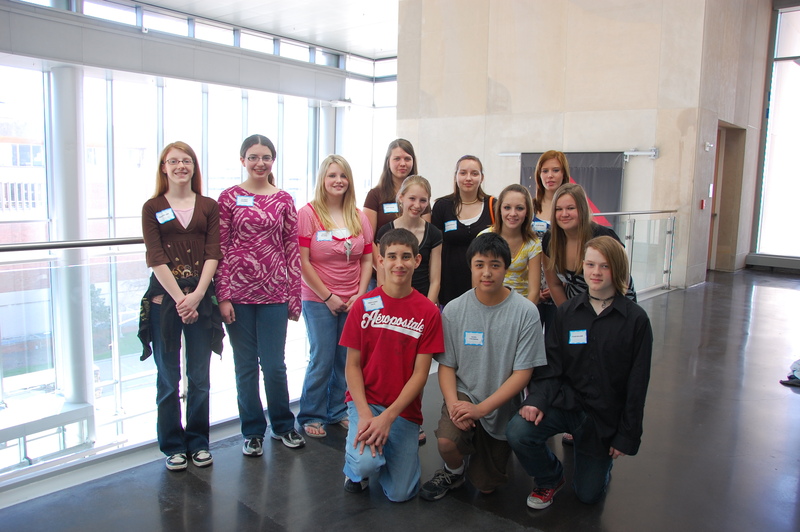 The Youth Health Service Corp is a program designed specifically for High School students. In the YHSC students 14 and older who have an interest in pursuing health careers get the chance to shadow and volunteer with local professionals and in professional facilities. In addition to the opportunity presented to them by observing, they also receive training in various basic aspects of health care such as Confidentiality and Ethics, Hand washing/Universal Precautions, even CPR/AED training. If you would like more information about either of these programs, please contact Chris Lauderbaugh at clauder@hoosieruplands.org . If you would like to partner with us in our Rural Clinic Exposure Initiative as either a new health professional program or health care facility, please feel free to contact Michael Edwards either email medwards@hoosieruplands.org or phone 812-849-4447 or 1-800-827-2219. Thank you for your interest in preserving the quality of rural healthcare. Springs Valley Community Schools - SVCS was awarded funding to help with costs associated with hosting a Science Fair for grades 6-8 with an emphasis on Health Careers. Southeastern Career Center - Funds are being provided to the Southeastern Career Center to help send students to the 2009 HOSA Conference. IU School of Dentistry - SE/SCI AHEC will be providing funds for 12 students to receive scholarships to attend a Dental Summer Institute put on by the IU School of Dentistry. AHEC is also providing funds for the development of two pre-dental clubs that will provide mentoring and activities designed to enhance students' knowledge about careers in Dentistry and foster relationships with college preparatory staff and then dental community. Indiana University School of Dentistry was excited to welcome 12 members of the Scottsburg Middle School Pre-Dental Club (sponsored by SE/SCI AHEC - Hoosier Uplands) to participate in the 17th annual IUSD Research Day! The event took place on Friday, April 24th. These middle school students traveled from Scottsburg, Indiana to present their research posters along with the posters displayed by current dental students. The Pre-Dental club has been meeting once per month after school. Members broke into teams and began researching a dental topic of interest to them such as: the dangers of oral piercings, oral health problems associated with tobacco use, oral health problems caused by bulimia, and a look at whether chewing gum is good or bad for your teeth. IUSD Research Day gave these students the opportunity to display their hard work and to discuss these topics with dental students and dental faculty. 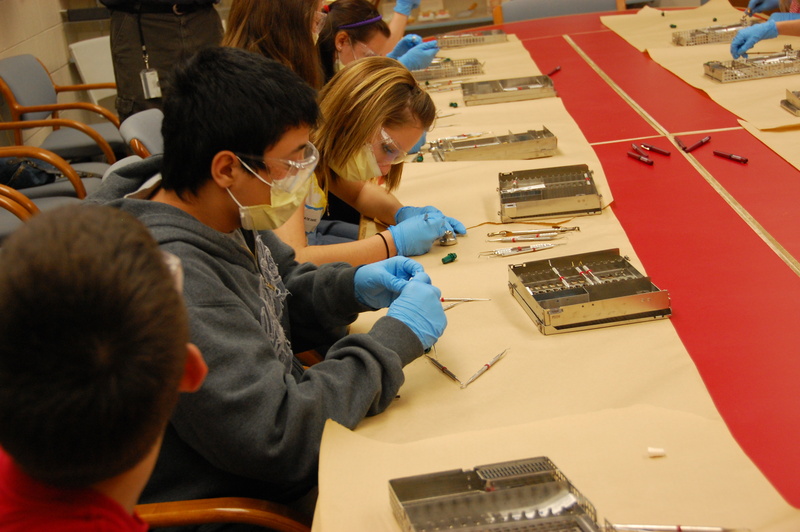 Students also participated in a tooth filling activity, a hand washing activity and toured the dental school facility. If you would information on starting a pre-dental club in your area, please contact Pamela Clark for more details at 317-278-1758 or pamelac@iupui.edu . 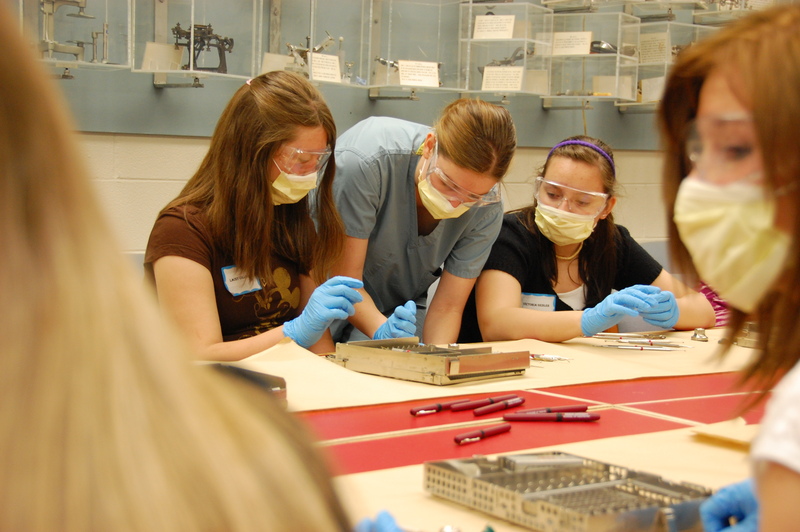 Hanover College and Kings Daughters Hospital - SE/SCI AHEC will be providing scholarships for a week long Forensic Science Camp that will be held at Hanover College in Madison, IN. The program title will be 'A Watery Grave' because students will encounter a body found in the Ohio River. The setting will allow students to experience scientific disciplines in Physics, Geology, Biology, Chemistry, and Psychology. 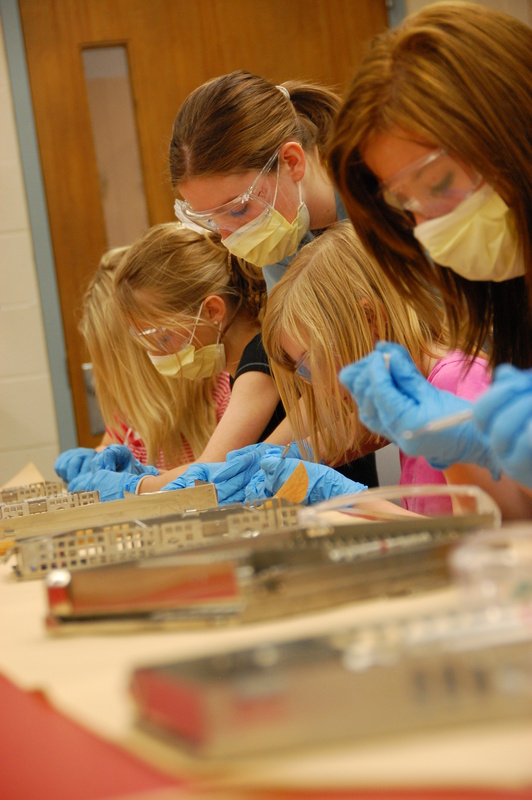 They will learn about the variety of health careers available in the sciences. Bloomington Hospital of Orange County - Bloomington Hospital of Orange County was awarded funding to hold a Kid Sitters class where students learn CPR, First Aid, Babysitting Skills, and learn about careers in the Health Field. IU Southeast - The IU Southeast School of Nursing was awarded funds to purchase Virtual IV Training Arm kits to help improve existing IV therapy education for baccalaureate nursing students. They will also offer the facilities of the school to regional healthcare organizations for staff development in IV therapy. 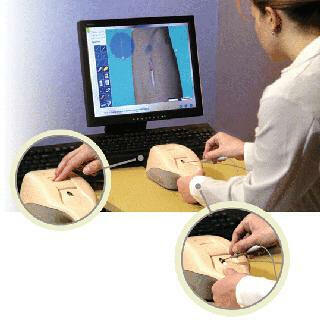 Check out: http://www.laerdaltraining.com/Virtual-IV/ for a short video about the Virtual IV. C4 Columbus Area Career Center – SE/SCI AHEC is providing funds for the C4 program to buy a centrifuge that will be used in their health career training classes. Rush Memorial Hospital and Bloomington Hospital of Orange County - Both hospitals were awarded funding to purchase a CareLearning Learner Management System for their hospitals. CareLearning is an online software that will help improve the quality of health professional's education and health care services by making quality education easily accessible. You can check it out at http://www.carelearning.com. Community Mental Health Center - The SE/SCI AHEC will be providing funds for the purchase of a membership to Essential Learning, an Internet based Staff Development program that aids in retention of their staff by supplying them with the training they need to perform their jobs. They were also awarded a mini-grant for funds associated with Annual Trainer Fees and Books for the Crisis Prevention Institute Training. IU Souheast Division of Nursing - They were awarded funding to put on a workshop entitled Ethics and Caring in Healthcare Conference to help raise awareness of the ethical issues when caring for patients.